Head east over the bridge that spans Lake Ray Hubbard between Garland and Rockwall and within moments you might find your gaze locked on a rock-faced building set off to the south. A sign over the door there may seem simple and unassuming, but in a single word it tells you all you need to know..."Brewery." 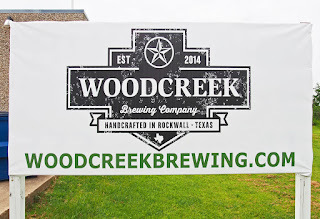 Located right off I-30 in Rockwall, the brewery in this case is Woodcreek Brewing Company, and it's the work of partners Noah Cutshall and Brad Bramblett. Both are Texas transplants who've made their home in the city, Cutshall having grown up in St. Louis and Bramblett in the Pacific Northwest. As for the name Woodcreek, it's a nod to the neighborhood where they spent two years perfecting their recipes in Cutshall's garage. Originally the company was called Longhorn Brewing, but Woodcreek was chosen for a more personal touch, since it was the place where the brewery got its start. In the end, while the word "longhorn" is iconic and synonymous with Texas, its ubiquity as a business name suggested it just wasn't the right fit. 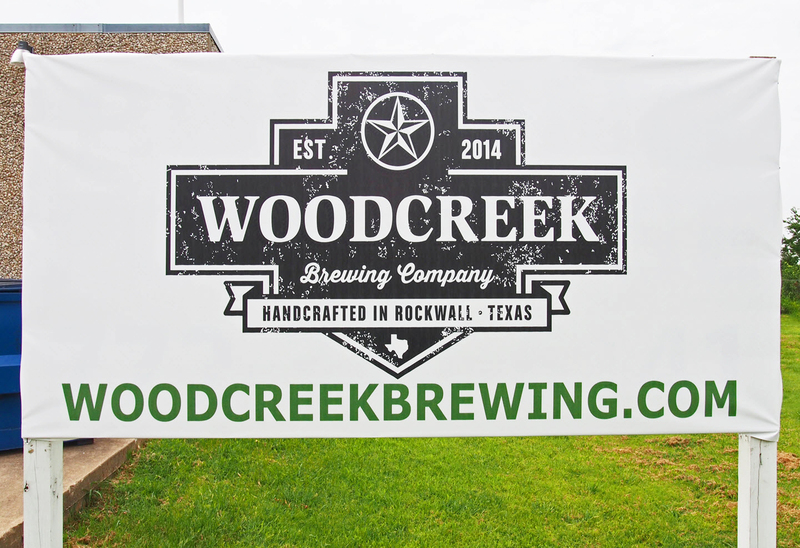 Now, with permits in hand and construction entering the final phase, Woodcreek has set its sights on becoming the first brewing operation of any kind in Rockwall. The company's two-vessel, fifteen barrel brewhouse is up and running and the taproom is taking shape. The 3800 square foot facility is almost ready to welcome visitors, it's just a matter of a few finishing touches and waiting for the first round of fermentations to complete. Woodcreek's easily identifiable entrance (left) and already operational brewhouse (right). Upon opening, one of Woodcreek's beers will appropriately be called New Horizon. It fits because it's the slogan for the City of Rockwall and it speaks to the founders' approach. Rockwall is a fast-growing community, and Woodcreek hopes to grow along with it while working to develop the local craft beer culture. Rockwall may be a suburb of Dallas, but Bramblett makes the point that many who commute for work look to find entertainment near home. That's especially true for Rockwall, he says, because once people cross the bridge on Friday afternoon, they have no intention of turning back until Monday morning. Bars are somewhat scarce in the city due to its 50-50 food-to-alcohol sales ratio, so while they had to fight to get city approval for a taproom, there's a great opportunity to become a local destination. If you're wondering what they'll serve, the area's warm temperatures and proximity to the lake will drive a focus towards more sessionable styles. It makes sense, especially if you take into account their goals for expanding local palates, as they hope to steer more lakeside Coors-light drinkers towards a better brand of beer. The aforementioned New Horizon (a hoppy wheat beer) is designed to help with that effort, as is the kölsch-inspired Lakeside Blonde. Those brews, along with others like Texas Star Bock, Rockwall Red and Hwy 66 IPA will be draft only for the time being, and plans are to be highly adaptable when it comes to the brewery's portfolio. While they've got a stable of recipes ready to go, as of now there are no plans to identify any year-round beers. Basically, whether or not a beer gets brewed again will depend strictly on the market. So, when will Woodcreek open? Cutshall says they are no more than a few weeks away. He and Bramblett just want to make sure they've got all their bases covered before setting an official date. Stay tuned to the brewery's social media accounts (click the buttons below) for updates on that, as well as details on weekday taproom hours and the start of Saturday tours. Labels: new breweries, preview, Rockwall, Woodcreek Brewing Co. Thanks for the coverage, Brian! Happy to do it. Thanks for letting me stop by and see the place. Looking forward to the opening!